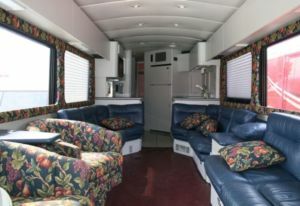 This ground-up interior conversion began with a 1992 MCI D-model motor home. 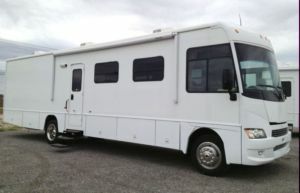 This vehicle wasn’t your typical motor home, and its previous owner isn’t your average-Joe. 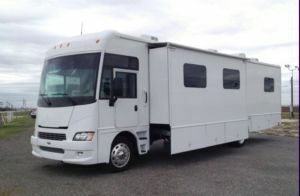 The coach belonged to a famous racecar driver, and it was built from scratch for he and his family more than 20 years ago. The interior was as nice as they came during that time, but the new owner (a company that provides hearing services) wanted something very different. 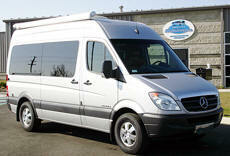 The soon-to-be transformed coach was laid out by CMI and the customer. The coach is being used to bring hard-to-find services into the lap of those that need them most. 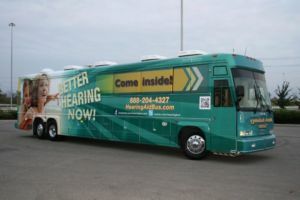 With an onboard lab, this bus will be able to examine customers and custom fit them for various hearing apparatuses. 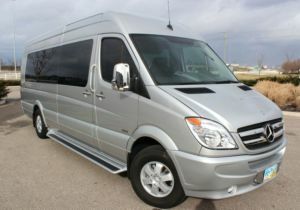 In addition, the bus will travel around the country to clinics and offices to give presentations on new products and practices. 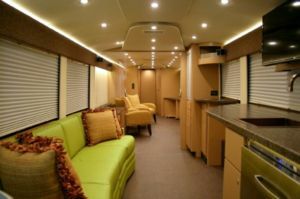 The vision for the coach included multiple workspaces, presentation areas, a bathroom, plenty of storage, waiting room seating, and a reception area with entertainment and beverages. When it was all said and done, the MCI had all of that, and more. Beginning in the front; the step-well area was done in luxury vinyl tile with corrugated copper accents. There is also a curved stainless steel banister that wraps around a large, custom-built column to the left of the stairway. The LED-lit column was built as a show piece and is fabricated from curved, clear acrylic. This piece can also be wrapped with vinyl graphics (branding) that will be backlit through the clear acrylic for a ‘pop’ of visual interest. Beyond the entry, the driver’s area was redone and brought into modern times with a reupholstered seat and refinished dashboard. Moving rearward, a warm glow fills the comfortable, yet modern interior thanks to new LED lighting throughout. Hip and funky fabrics also add liveliness to the calm interior. 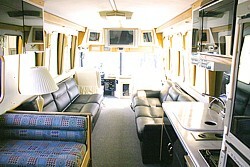 The first area of the coach contains the cozy waiting room lounge. 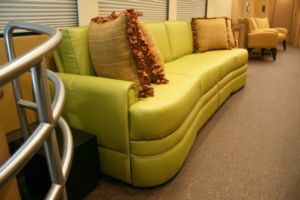 The passenger side of the vehicle has an impressive, custom-built 100-inch sofa done in a lime green color. 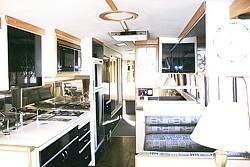 Across the aisle is the galley/coffee bar with an integrated 32” LED TV. 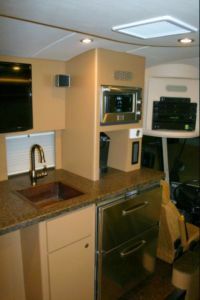 This galley area also contains several stainless steel appliances, a sink area, ample storage, beautiful curved Avonite countertops, and a bar area with three plush stools. 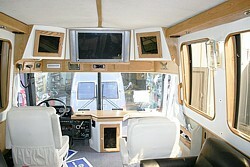 For larger groups on board, a 46” LED TV was installed with a surround sound system on the front header (above the driver). 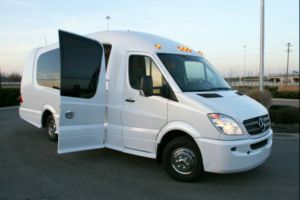 Passengers will pass custom storage compartments and come to a one-of-a-kind, semi-hidden doorway on their way to the back area. 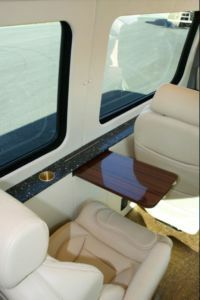 To ensure privacy, but not close off the airiness of the coach, CMI built a custom acrylic pocket door system. This clear partition allows you to see all the way through the coach, but blocks out sound from the distinctive sections of the vehicle. 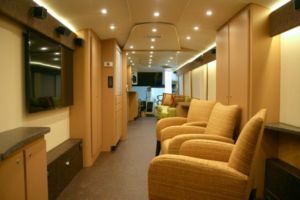 The back half of the coach is an open-concept room that acts as an office space, a presentation area, a hearing lab, and a meeting space. Comfortable armchairs allow those aboard to sit and meet as a group, kick back and watch a presentation video on the 55-inch LED TV, and meet with a professional service provider at one of the curved Avonite work centers. This rear room has storage for all of the hearing laboratory equipment and other office items. The flexible work space creates a relaxed atmosphere for employees and patrons alike. 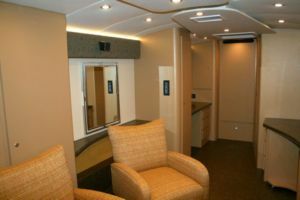 To add to the flexibility of the coach, CMI built a large bathroom out of the way in the rear driver’s side corner of the bus. The restroom is a great convenience for the employees and customers as it allows them to setup and be self contained for as long as they need. 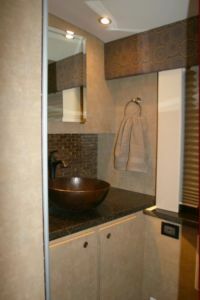 The bathroom features the same warm and funky design scheme as the rest of the bus and includes a beautiful copper vessel sink. Lastly, the exterior was wrapped in bright and exciting graphics to make sure you can’t miss the coach on the road. 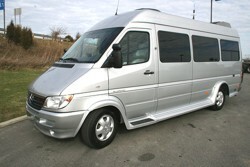 With information and branding, there is no mistaking what this unique bus can do for customers. You would never know that a race-inspired paint scheme resides beneath the wrap from its days as a home-away-from-home for an all-time racing great.